I'm a city girl. I never slept in a tent or wore a backpack until nine years ago. I became involved in Cub Scouting and it's been uphill ever since! We camp about 40 to 50 nights a year in locales ranging from a primitive Baja beach to the Sierras to Southwest deserts. I also enjoy paddling and the occasional geocache. This year, my plan is to begin backpacking. Looking at the contents of my garage, I realize that I need a 12 step program for gear addicts. Colors avaialble: the manufacturer's website indicates a color choice of blue, orange, black, burgundy, or different shades of gray. I received the package at the Post Office on May 18th, 2007. It contained the GuidePro shirt, a mesh stuff sack, and a note. Although the packaging was torn, the shirt was in good condition. It was a bit heavier than I had anticipated after browsing the manufacturer's website. 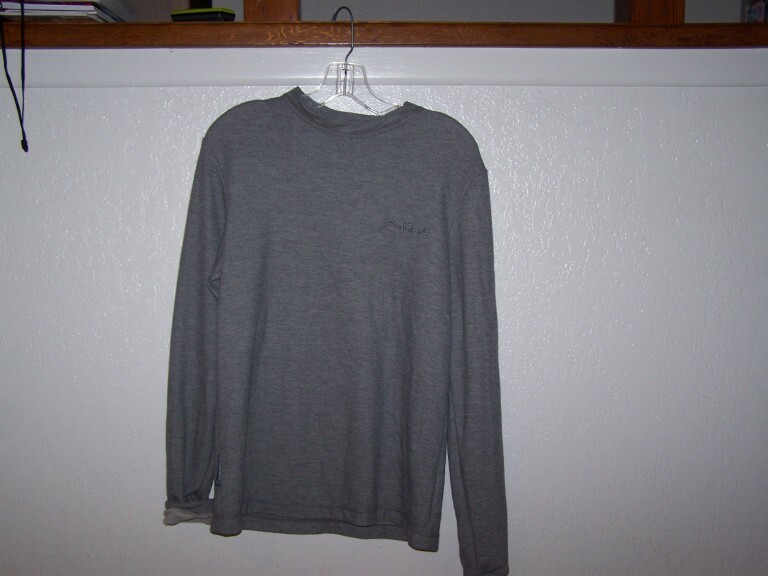 The shirt looks like a form fitting sweatshirt, especially since I received a ' light gray ' color which appears to me to be a medium gray. I find this color to be very versatile as it coordinates well with sweats, jeans and Boy Scout trousers. During the first week that I have had this shirt, I have also worn it with light blue nylon zip-off pants and navy long johns. I believe that the GuidePro shirt may be an item of apparel that is not limited to only being worn as a base layer. Its appearance is appropriate for casual wear as an outer layer as well. Upon touching the shirt fabric, the hand of the fabric felt more like a cotton / poly blend than a wool / poly blend. As with typical fleece items, the exterior was smooth and the interior, skin side, was textured. The wool fibers were not visible to me except in direct sunlight. Per the manufacturer's website, the shirt is a blend of wool, cotton, viscose, and polyester. The seams are finished with a serged overlock. The seams are 1/4 in ( .64 cm) wide. As I anticipated, I have to roll the sleeves up four inches or push them up on my forearms, as shown in the photograph. When I pulled the fabric up to my elbows, I had welt like creases on my skin at the elbows after four hours of wear. However, at night, I pulled the cuffs of the shirt over my hands and I was warm and comfortable. The body of the shirt fit nicely, neither too tight nor too baggy, but the shirt is not cut for a woman's body. The temperature the first evening that I wore the GuidePro shirt was in the 70's F (21 -22 C). I ran errands and attended a meeting and remained comfortable wearing the shirt. I wore the shirt this past weekend for a three day camp at Lost Valley Scout Reservation in the Anza Borrego Desert of Southern California. The temperatures were rather mild this year, ranging from 40 to 80 F ( 4 to 27 C). The altitude was about 4000 ft ( 1219 m). I was pleasantly surprised at how comfortable the shirt felt. I wore it to sleep in for three nights. The temperature dropped to the low 40's ( 4-5 C) during the night. I did not feel the need to add another layer nor did I feel sweaty as sometimes occurs when I wear polyester shirts. By 8 am in the morning, the sun was too hot for long sleeves, even just sitting around in the shade. After sunset, I put the shirt back on, but I needed an extra fleece layer to stay warm when I was not moving and the temperature was below 60 F ( 16 C). My GuidePro shirt is a size medium and I wore a Patagonia Women's size large fleece sweater on top of it. The fit was just a bit too snug for my taste. I seldom read instructions. There is a label on the shirt with pictorial washing instructions. Although the shirt was not visibly dirty nor stinky, when I returned from camping, I threw it in the washing machine with other items and washed it as I would anything - cold water, gentle cycle and liquid detergent. I did allow the shirt to dry on a hanger instead of in the dryer. It took about three hours to dry. The shirt smells very nice now and is quite soft and cuddly. There are a few wrinkles around the hem. There appears to be no shrinkage. I would consider the shirt to be a cool weather base layer. It is not constructed of a thin, wispy, transparent fabric, but is a medium weight and opaque - skin and / or undergarments do not show through. The daytime temperatures I will encounter in the next few months will preclude wearing the shirt for long periods. I will wear it in the evenings, to sleep in, and for as long as the temperatures allow me to in the mornings. I will wear the shirt immediately next to my skin and with a camisole underneath to permit improptu removal on the trail. I will try different top layers for fit and comfort. I will wash the shirt by hand while camping. I am interested in whether it retains stains or odors and if it will stay soft to the touch. Rain is unlikely, but I will wear the shirt to flatwater kayak and to practice wet exits. The specific trips I have planned for the next two months are a local backpack trip to Lake Perris SRA, ten days camping in the San Gabriel Mountains, three or four nights in the San Jacinto Mts, three nights in the Southern Sierras, two nights in the San Diego desert, and a night in the San Gorgonio Wilderness. I am presently very happy with the Malachowski GuidePro Base Layer Shirt. I would prefer a woman's cut, wider sleeves, and a V neck. I will continue wearing the shirt whenever possible and testing its durability and comfort. A Field Report will issue in about two months, the end of August 2007. During the time period that I tested the shirt, I would wear sleeveless cotton shirts until sunset, when I would don the Malachowski shirt. I slept in the shirt with cotton knit pants and really only needed a sleeping bag when the temperature was very low. In the morning, I would change out of the shirt after breakfast - about 7am - when it was becoming too warm. I found the shirt to be hypo-allergenic. I have had clinically senistive skin, including atopic dermatitis and a tendency to chafe, even from cotton. The shirt felt slight itchy for the first five minutes that I wore it, but then felt soft and comfortable as fleece. Occassionaly, I experienced skin redness, but I believe that this was due to the heat and not the fabric. I slept in this shirt quite well with no complaints as to the texture or feel against my skin. A problem that I did have with the shirt was with the fit. The sleeves were a bit tight on me and I would have preferred a wider or V neckline. 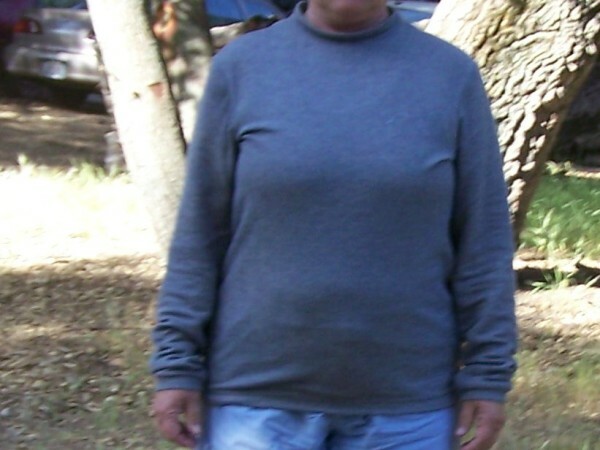 The length and torso fit were good and I was able to wear a camisole underneath the shirt and a loose fleece jacket on top. The shirt was most comfortable from 45 F ( 7 C) to 55 F ( 13 C). The cooler temperatures occurred at night when I was not actively moving around. At 40 F ( 4.5 C), I had to snuggle into my sleeping bag to stay warm, but at 45 F ( 7 C), I could sleep with loose coverings. The shirt maintained its appearance through 6 machine washings and dryings. It was bunched up with the other camp clothes and received treatment typical of any other item. It did not shrink, wrinkle, fade or hold odors. The weather was too warm to test whether the shirt blocked the sun, but I noticed that I did not need insect repellant when I wore the shirt. It was very comfortable when worn at lakeside with a slight breeze. Although I did not have the opportunity to exert myself while wearing the shirt, I did not feel hot or sweaty in it. I beleive that the fabric is breathable, at least to some extent, because I typically cannot sleep in synthetic clothes because Iwake up in the middle of the night drenched in sweat. The Malachowski shirt was as comfortable for me as a cotton shirt. At this time, I do like the shirt. The fit is a bit tight for hot summer wear, but is comfortable for lounging around campsites. I plan on testing it during cooler weather to see how well it performs during active pursuits or when wet. I am hoping to have cooler weather in order to give the shirt a more thorough testing. I will wear the shirt to go night kayaking on Newport Bay and Mission Bay, California. This will expose it to wind and moisture. I also plan on hiking in the San Jacinto Mountains of California as well, to test how the shirt performs while carrying a pack. This will conclude my long term testin gof the shirt and a final report will then be forthcoming. Due to poor health, I had to cancel the three camping trips I had booked this fall. The weather locally has been very warm and I have not worn anyhting heavier than a short sleeved cotton shirt. Unfortunately, I have not been able to test the shirt further. The shirt has maintained its neat appearance through many washings. I have not chosen to wear it on warm days, it is an item I would select for cold weather. Due to the body hugging fit, I would also choose to wear it as a base layer and not attempt to wear it over other layers of clothes. The only aspect of the shirt that I do not like is the neck line. I would prefer a more open or wider neckline. The shirt is warm, attractive, comfortable to the skin, washes well and smells nice as well. I do plan on wearing the shirt when the weather cools. The look of the shirt is suitable for around town. If I am able to go out in the mountains this winter, I plan on wearing it as a base layer while out in the snow.